Congratulations to Vhoebe, a Belgian Malinois, who broke the world record for dock diving at an incredible 32 feet, 3 inches. 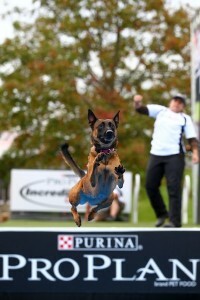 Vhoebe’s world record jump happened on Saturday, 6th October 2012 at the 15th Annual Purina Pro Plan Incredible Dog Challenge. Vhoebe, who lives in San Diego with her guardian, practices five to six times per week. She’s very fit!